Cave of the Dice Chucker: So what did come of Tramp? So what did come of Tramp? Thanks for the ride, Dave. Yes, I know; back in the late 80s, he dropped his ongoing Wormy cartoon mid-storyline and disappeared without a trace. Then in the early 00s, thanks to the Saluki student newspaper, he briefly resurfaced as a cab driver in Southern Illinois and has remained out of the public eye ever since. But really, his vanishing act started long before that. 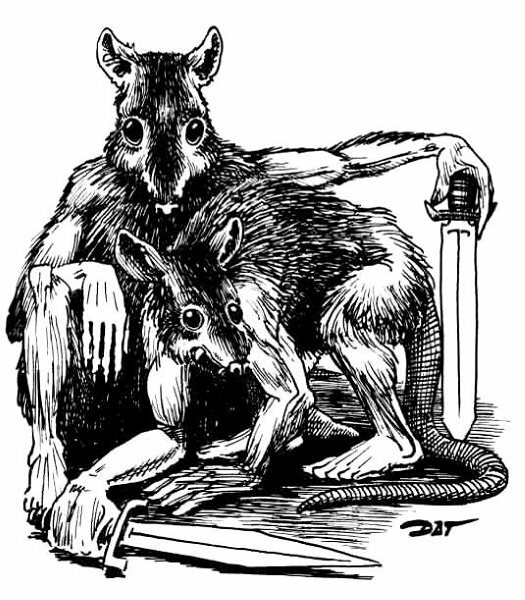 With only my admittedly incomplete collection of early D&D products to go on, it seems that Tramp came into the TSSR fold in ~1977, when he contributed a few drawings to the Holmes Basic D&D book and then split up the bulk of the artwork for the Monster Manual with David Sutherland. They teamed up again for the PHB in '78 and the two of them handled most of the early module art as well--notably, Tramp did all the artwork for the original T1 Village of Hommlet (1979), with Jeff D's cover art showing up only with the later printings. Also in 1979 came the DMG, the third core rulebook of the Game. But rather than another tag-team effort between the two Daves, this one features more of an ensemble cast. The artist with the greatest visual presence in the DMG is probably Darlene, followed by the numerous single-panel cartoons of Will McLean, though DCS also made his mark. There are some early Erol Otus, DSL and Roslof pieces as well. Tramp's contribution was limited to about 5 or 6 new illustrations and a rerun of his Satyr drawing from the MM. It is, however, the venue of one of his most iconic drawings: the full page Emerikol the Chaotic. But by 1980, Wormy notwithstanding, Tramp is pretty much gone. His name is listed as a contributor in the Deities & Demigods cyclopedia, but, to my eye, no illustrations in it are obviously his. 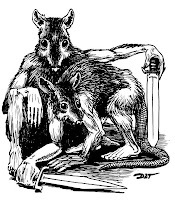 [EDIT: As it turns out, several of the drawings in the American Indian Mythos and at least one in the Central American appear to be Trampier's. Thanks to ClawCarver's sharp eye for catching these.] And the Moldvay Basic rules are completely bereft of the Trampier touch. His only presence in the TSR-verse from 1980 on seems to be the Wormy cartoon from Dragon magazine. Indeed, this article about life at TSR verifies that by 1981 he was no longer contributing to the "gaming side" of D&D. I'm guessing that he couldn't have been living too high on the hog on the proceeds from Wormy alone, and I've never seen any works of his published outside of TSR; some old school reprobate would surely have dredged up something by now if he'd been, say, contributing work to a competitor--Lord knows Judge's Guild could've used his help. 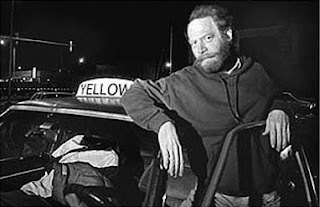 So perhaps even back then he was driving a cab or some other anonymous vocation to put a table under his bread. Which is to say, one foot was already planted outside the rpg art bizness. What is astounding to me is that virtually everything we came to know and love about Tramp was drawn (or at least published) between 1977 and 1979. Two or three years this young man--Wikipedia says he woulda' turned 25 in'79--had to influence the imaginations of millions of gamers, and man did he take advantage of that time. Thanks Mr. Trampier. Interesting post. Now I have to find out more. His stuff is amazing. As for Deities & Demigods, look again at the American Indian mythos. Shakak and Snake-Man are definitely by Tramp, and perhaps some of the other, "totemic" pics. Thanks for the tip Claw Carver. I gave the American Indian Mythos a closer look, and I think I'd go so far as to say that Hiawatha and Thunder Bird also show some serious Trampian traits. Raven, Coyote, and Hastsezini could easily be his as well, which would fit with the one artist doing the bulk of each mythos structure that they had going on for the DDC. I think you're right. Over in Central America, Quetzalcoatl is definitely by Tramp and I think Tezcatlipoca might be too. Off-topic, I just noticed Jim Roslof's little Mesoamerican-style "name badge" in the pic of Huitzilopochtli. Wonderful. For me, Roslof is the art hero of that particular book. If I owned a van, Roslof's full-page Thor vs. the Midgard Serpent would absolutely be the frontrunner for the mural.